Ria and Elizabeth seem to be authors of a very different type: Ria is a YA (Young Adult) novelist, while Elizabeth is an astrophysicist who writes popular science. The first part of this talk will tackle a crucial question: why are they presenting together? The two authors will discuss how they came to work together unexpectedly through Ria’s novel. Ria will then explain the process and research for her novel, The Centre of the Universe, and how the use of space metaphors help explain relationships between the characters. 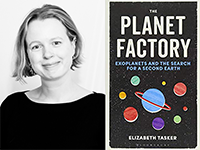 Elizabeth will then cast a scientific eye over these same metaphors, before moving on to talk in more depth about her own research and book, The Planet Factory. Book signing to follow after the event. This event is presented by UBC Department of Physics & Astronomy and Curiosity Collider Art-Science Foundation. 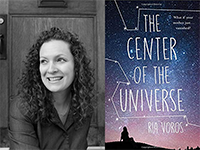 Ria Voros is a YA author whose latest novel, The Centre of the Universe, explores the relationship between mothers and daughters and also explores a teen's passion for astronomy. Ria has an MFA in creative writing from UBC and her books have been nominated for several awards across the country. She writes, teaches and lives in Victoria.